A few months ago Dora introduced us to a new room escape developer, Choko-Chai, a designer with a thing for cats and thieves. It is with great pleasure we now bring to you a Christmas Eve present in the form of an escape called...Christmas Eve by the same folks. The basic premise of the game is simple: it is Christmas Eve, your boyfriend is on his way over, the tree is not decorated, and you can't remember where you stored the ornaments. You must wander around your apartment looking for clues and solving a lot of puzzles in order to get everything ready to go by the time Mr. Right gets here. Better start searching! Navigation in the home is accomplished by some large white arrows at the sides and bottom of the screen. Christmas Eve featues everything you'd want from a room escape: An easy to use inventory, a changing cursor to indicate hot spots, cute graphics, a save function, and most especially a wide variety of challenging puzzles. The game comes in both Japanese and English flavors with a pretty decent English translation. The only complaints folks might have about this delightful holiday romp are the plethora of color-based puzzles without the help of hovering text to let you know what shade is what. With its wide variety of puzzles and cute premise, though, Christmas Eve is a year-round treat of room escaping goodness. Enjoy the special bonus pictures of the designer's real-life cats decked out in their Holiday finery if you are up to the challenge of getting everything decorated before the boyfriend shows up. Hey, a date who brings both wine and chocolate cake? That's worth solving a few puzzles! 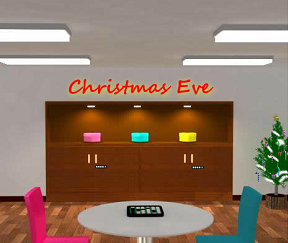 Christmas Eve (Escape) Walkthrough now available! Choose your language at the start screen. You cannot try to put in a puzzle solution until you've seen the hint, so no forced cracking of the puzzles is possible. Remember to look at things very closely. There will be directions for the color-blind where possible in the walkthrough. You begin facing a wall with a fireplace and a 3 x 3 cabinet. Click on the fireplace for a close up. On top of the fireplace is a fancy candle holder, back up. There appear to be nine cubbies here, each with a door with a colored knob. On top of the cabinet are four snowmen, a green one, an orange one, a blue one, and a red one. Click on the snowmen for a close up. In the middle of the cabinet top, between the orange and blue snowmen, is a shiny spot, click on it for a close up. Looks like we need a Phillip's head screwdriver here. Back up once. If you click on each snowman for a closer close up you will notice they are holding a blank sign. Back up once. Hey, while you're looking at the snowmen did you notice the "Merry Christmas" on the wall behind them? There appears to be something sitting on the last letters, the as at the end. Click on that section of the sign for a close up. We found a light blue key! Take the key and back up twice. Let's take a closer look at the cabinet. Each door has a colored knob, and each has its own lock. The top row, from left to right, has a yellow knob and needs a key, a pink knob and is mysteriously stuck, and a dark blue knob and has a four digit code involving symbols. The middle row, from left to right, has a red knob and needs a key, a green knob and a 6 x 6 grid of some sort, and a door with no knob. The bottom row, from left to right, has a light blue knob that needs a key, a purple knob with a four digit code, and an orange knob that is mysteriously stuck. While the cabinet is in close up so that you can see all nine cubbies, click to lower right side of the cabinet. A side view shows that, like with the yellow knob door on the top row the orange knob door has a screw holding it closed. This one needs a flathead screwdriver. Click on the space behind the cabinet for a close up. There on the floor, between the cabinet and the wall, is a paper of some sort. However it is too narrow for you to reach. You are now facing a table with two chairs. Against the wall is a large furniture piece that has two cabinet doors below and a shelf with boxes above. Click on the table for a close up. Hey, it's an Othello game! Back up. Click on the large cabinet for a close up. Looks like two sets of doors below, each with a four digit lock of some sort. Click on the left (pink) box on the upper shelf for a close up. Click on the top of the heart-shaped box to open it and take the item (ball). Note the ball has a pink key inside, but you can't open it. Back up once then click on the center (light blue) box for a close up. This one appears to need a four digit code based on position. Back up. Click on the right (yellow) box for a close up, then open it. Inside you will find tweezers, take them. To the right of the cabinet is an undecorated Christmas tree. Click on the tree for a close up. Back up and click on the base of the tree for a close up. Note the electrical outlet. You are now facing a bank of four floor to ceiling windows. Notice the little sparkle in the sill of the second from the left window. Click on the bottom of the second from the left window for a close up. Yay, the metal part of a flathead screwdriver! Take it and back up. Each window has a shade at the top, but you can't pull them down. To the right of the windows is a small box on the wall, click on it for a close up. Looks like we need another key. Back up and turn right. This is the door out. Looks like it's locked. Turn right. And we're back to the fireplace and the 3 x 3 cabinet. Time to solve some puzzles! Click on the cabinet for a close up, then click to the lower right of the cabinet to see the side. Click behind the cabinet to see that space between the cabinet and the wall. Use the tweezers to retrieve the note from the space. Once you have the note, click on it to open it. Note the colored numbers around the corners (upper left is a green 2, upper right is a yellow 4, lower left is a red 3, and lower right is a blue 1). Also note the backs of the colored snowmen, from left to right blue, green, red, and orange. A third thing to note is the light blue heart-shaped box with the circular arrow going around clockwise, starting at the top. Close down the note and you will see a key in the gap. Use the tweezers to grab the key (yellow key). Back up twice to the front of the cabinet. Click on the upper left (yellow) door of the cabinet and use the yellow key to open it. Inside you will find a white knob. Take it and back up once. Click on the lower left (light blue) door of the cabinet and use the light blue key to open it. Inside is a box of matches, take them. While the matches are in close up, click on them to open them. Can you see the hint of numbers in the open section of the matchbox? Click on that back section for a close up and you will find the clue of a heart and the numbers 8614. Close down the matches and back up once. Click on the middle right door, the one without a knob, for a close up. Use the white knob you just got from the yellow cubby on the hole, then open the door. Inside you will find the metal part of a Phillip's head screwdriver, take it and back up twice. Okay, we have the screwdriver heads, where's the handle? Time to solve a different puzzle. Click on the fireplace for a close up, then click on the fancy candle for a close up. Use the matches on the candle to light it. Hey, do you see the symbols on the candle holder? That looks like a star, a double K, a circle with a line to the left, and a diamond. Click on the large cabinet for a close up, then click on the middle (light blue) heart shaped box twice until you can see the puzzle on the top. We know the answer to this, don't we? The answer is partly in the note found behind the 3 x 3 cabinet, and partly on the matchbook. The matchbook gives us the code, 8614. The note shows the box and shows us to start at the top and go in a clockwise direction. So the top number is 8, the right number is 6, the bottom number is 1, and the left number is 4. Enter the numbers and press the center button to open the box. Inside we have the handle for the screwdrivers! Take it and back up twice. Click on the lower right doors of the large cabinet for a close up. This lock seems to involve the numbers 1 through 4 and different colors. Where have we seen something like this? We've seen this on the note. Remember the numbers in the corners of the note? The 1 was dark blue, the 2 was green, the 3 was red, and the 4 was yellow. Enter those colors into this lock. For the colorblind: Click the 1 button six times to get to dark blue, click the 2 button twice for green, click the 3 button once for red, and click the 4 button four times for yellow. Once you've entered the colors, click the button to the right of the code lock and the doors will open. Inside you will find a hammer (take it) and a diagram of some sort. Note the numbers 4132 underneath the drawing. Click on the 3 x 3 cabinet for a close up, then click on the upper right (dark blue) door for a close up. Here's that four digit symbol lock. Remember the clue from the candle holder? Enter the same code you saw on the candle holder (star, double K, Circle with line, diamond) to open the door. Press the large button below then open the door to get cotton balls. Now it's time to use the screwdriver. Click on the snowmen on top of the cabinet for a close up. Click on the shiny spot between the orange and blue snowmen for a close up. This is the one that need's a Phillip's head. Pull up the screwdriver handle from your inventory, then use the Phillip's head on it to assemble. Use the assembled screwdriver to remove the screw and back up twice. Now click on the top center door (pink knob) for a close up and open it. Take the ornament presents and back up once. Now click on the lower right side of the cabinet to see the screw there. Use the flathead screwdriver piece on the handle, then use it to remove the screw on the side of the cabinet. Back up once, then click on the lower right (orange handle) door for a close up and open it. Take the Othello piece and back up twice. Turn right to face the table with the Othello game. Click on the game for a close up. Notice that the game has one open square. Play the Othello piece on the open square. Note what happens to the board. Click on the 3 x 3 cabinet for a close up. Click on the center door (green knob) for a close up. Yeah, the 6 x 6 grid looks like an Othello board, doesn't it? 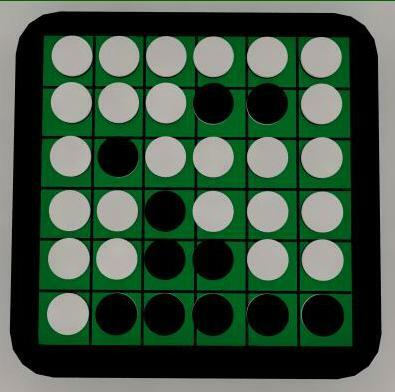 Recreate the white/black piece sequence from the Othello board (after you've played the white piece). Here's a screenshot of the board. When you've finished push the OK button, then open the door and take the candy cane ornaments. Pull up the ball from your inventory, the one with a key inside. Use the hammer on the ball to get the key (red key). Click on the middle left door (red knob) and use the red key to open the door. Take the bell ornaments and back up once. Click on one of the snowmen for a closer close up. Notice that their sign now has a number? The numbers appeared as you opened each colored door in the cabinet. Now all four snowmen should have numbers. The green snowman is 6, the orange snowman is 2, the blue snowman is 7, and the red snowman is 4. Where could this be useful? How about the bottom middle door, the one with a four digit number code and a symbol that looks like the number 8 next to it? But the numbers don't work in the order the snowmen are on top of the cabinet! The second clue to this puzzle is the note, specifically the color order the snowmen are on the note. On the note they are blue, green, red, and orange. That would make the code 7642. Enter the code and hit the button to the right of the code lock. Open the door, take the ball ornaments, and back up twice. Well, we have a lot of ornaments, let's at least start decorating the tree. Turn right to face the large cabinet (and the tree). Click on the tree for a close up. Start by using the cotton on the tree. Hey, did something fall off? Back up once, then click on the base of the tree for a close up. Yay, a silver key! Take the key and back up. Turn right to face the windows. Click on the small control box to the right of the windows for a close up. Use the key to open the box, then hit the "close" button and back up. The closed blinds now show us a number, 4853. Well, there's one more cabinet door to open. Turn left to face the large cabinet. Click on the cabinet for a close up, then click on the lower left set of doors twice for a close up. We need a four digit code here. But the numbers from the blinds don't work! You need to combine the clue from the blinds with another clue, the drawing found in the lower right of this cabinet. The drawing with four rectangles and the numbers 4132. Note how those rectangles look like the windows? The numbers under the rectangles give the proper order for the numbers to be placed in. That would make the code 8354. Enter the code and press the button to the right to open the doors. Inside you will find some Christmas tree lights. Take them and back up twice. Getting Out and Date Night! You have now rifled every closed cabinet door, time to finish decorating the tree. Place the bells, balls, presents, and candy canes on the tree. Place the lights on the tree. Hmmm, something is missing! There's the problem, the lights aren't plugged in! Click on the light plug, then click on the outlet to light the tree. Back up, turn right (or left) twice to face the door, then open the door. Enjoy the wine, cake, and kitty pictures. would've been nice. I couldn't figure out whether my attempts were working or not. Overall I liked it, and a bonus point for the cat pictures. Can't figure out the combination to the left cabinet. The clue in the right cabinet seems to go to it and it indicates "4132" which doesn't work. Using it as the order of the numbers on the blinds also doesn't seem to work. Using it as the order of the snowmen numbers doesn't seem to work. I'm at a loss. Hmmm. I got the first code, but the game still says I haven't got any hints so it wont allow me to enter any numbers. Cannot figure out the code for bottom center cabinet with snowmen too. I clicked practicalli evrywhere on this screen but I cannot zoom them. Found key for blue (bottom left) cabinet. So only one cabinet is closed (the left one, with heart-shapped boxes). It seems that the clue for it in the right cabinet (using the drapes digits). But it do not wokt for me. Have you get the paper and the key form the behind of the cabinets yet? Have all the cabinets with the snowmen on top of it open except for the bottom middle one. Can't seem to figure out what that clue means or how to use it. It's the old familiar problem that "4132" combined with "ABCD" can mean two different things. Does it mean "DACB" or does it mean "BDCA"? In this case, it means the second thing. A bit surprised by the end... I accidentaly clicked on the door, it opened and I was out with the feeling of unfinished business... like the gift boxes I couldn't retrieve from the cabinet and display at the bottom of the tree. Merry Crhistmas to all ! But the number that appears still hasn't helped any. I usually need help with escape games. This one not as hard as it seems. Click on matches, you will get code for blue heart. Needed the walkthrough for the final combination. Still have no clue how the right cabinet clue and the numbers on the drapes work together for a combination of 8354. I'm having the same problem AA referred to above: I HAVE a handful of clues, but the game is blind to this fact and refuses to let me input them! Anybody got help for this? If you haven't both lowered the drapes and opened the right cabinet, don't read on. Drapes from left to right read: 4853. Right cabinet reads: 4132. This means the 1st digit is "8" (since 1 on the left goes to 8 on the right), 2nd digit is "3", and so on. Many of the puzzles require more than one clue, you may have half of a solution, but it won't let you solve until you've seen the entire set of clues. Look for puzzles that let you solve, there should be a few.